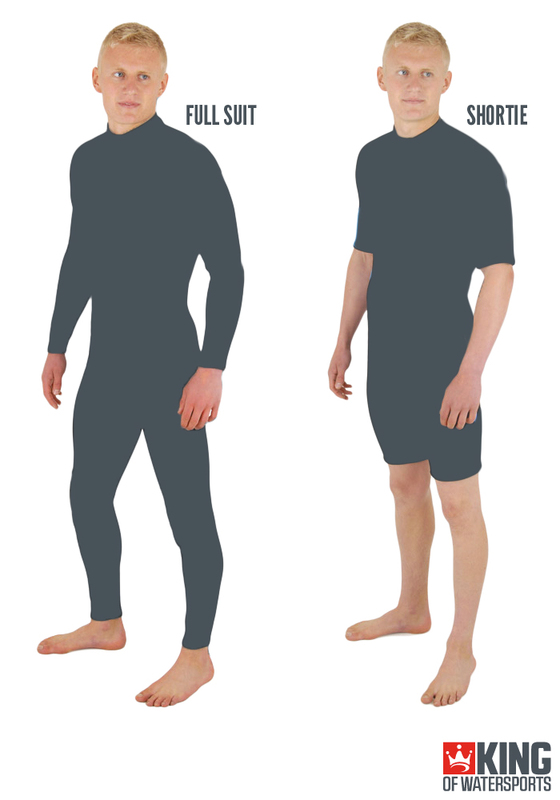 What is the difference between a full & shortie wetsuit? What cut & thickness wetsuit do I need? What is the difference between a back zip, chest zip, & zip free wetsuit? What is the different types of wetsuit seams & stitching? What brand wetsuit do I want? I have my wetsuit, what other accessories do I need? How do I look after my new wetsuit? A wetsuit's function is to keep you warm in the water and they are made out of a synthetic rubber called neoprene. 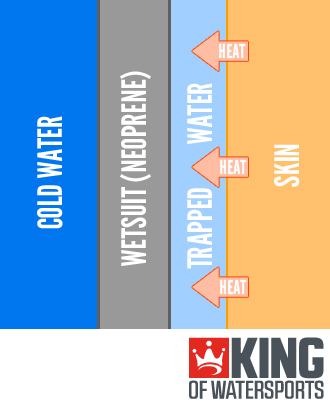 A wetsuit keeps you warm by trapping a thin layer of water between your skin and the neoprene. This thin layer of water is heated up by your body and therefore keeps you warm. It’s important to get a wetsuit that has a close and comfortable fit, otherwise cold water will constantly flush the warm water out. Full length wetsuits cover the whole body a part from your head, hands, and feet. Generally full suits have a thickness of 3/2mm, 4/3mm, or 5/4mm, & 6/5mm. The higher number refers to the thickness of the neoprene around the torso. The lower number refers to the thickness in the legs and arms. For example, a 3/2mm full length wetsuit has a 3mm neoprene thickness around the torso to keep you vital organs warm. While the 2mm thickness on the arms and legs is for flexibility when you paddle and swim in the water. ​A shortie wetsuit covers the torso, upper arms and thighs, allowing for unrestricted movement of the limbs. Shortie wetsuits are more often used in the summer (depending on the water temperature) because they offer great for flexibility and comfort in warmer water. Due to the stitching penetrating through the neoprene on most shorties, you will get cold a lot quicker in lower water temperatures. Water temperature is the primary factor in selecting the most suitable cut and thickness of wetsuit for you. Wind chill is shortly followed as a secondary factor if you participate in the wind sports. You can look at the average water and air temperatures for your area across the year from any detailed weather report. 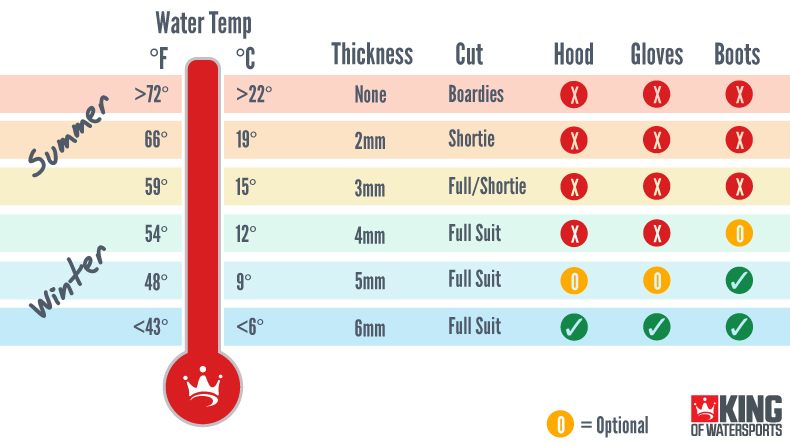 Once you know which temperatures you will be out in, please use our wetsuit thickness and cut chart below to choose the right wetsuit or combination of wetsuits and accessories suitable to keep you in the water all year round. There are three types of zip entry for wetsuits, the traditional 'Back zip', the popular 'Chest zip', and the latest 'Zip free'. Back zip wetsuits have a zip leading from the base of the spine to the back of the collar. This long zip length creates a large opening to enter the wetsuit so it is easy to get in and out. The downsides of back zip wetsuits include reduced flexibility and a looser collar that allows water to flush through, which on cold days can really wake you up! Chest zip wetsuits have a flap across the chest that creates a smaller opening and therefore improves flexibility. Getting into chest entry suits is more time-consuming than a back zip but the seal on the suit is better. This tighter seal on chest zip wetsuits keeps you warmer in the colder water and has less flush through. Zip free wetsuits offer ultimate flexibility with no restriction of a zip. Having no zip on the wetsuit makes it lighter and more watertight. This will increase the warmth of the suit and reduce the water flush. Wearing a zip free wetsuit is the closest feeling to no wetsuit while staying warm. To get the best fit for your wetsuit, you should ensure that it’s as tight to the skin as possible and prevents water flushing through the arm, leg and neck openings. Stopping a wetsuit from completely filling with water ensures the finest possible warmth and comfort. For most people sizing will be based on your height and chest size. Women can also base can base their wetsuit size on dress size, but again it must be close fitting otherwise you will lose the suits insulating properties. If in doubt measure yourself to get your precise dimensions. For detailed sizing information please see our wetsuit sizing guides. Wetsuits are constructed by stitching together different shaped pieces of neoprene. A well fitting wetsuit is essential for warmth, and the fit is achieved by connecting tailored neoprene panels. These panels are joined to each other by stitching along seams. The seams are less flexible than a panel of neoprene. There are three types of stitching used in wetsuit construction. Obviously, stitching involves making holes in neoprene and passing a thread through. These holes can let water though the waterproof neoprene, so the type of stitching is important when considering how warm and strong a wetsuit will be. Overlock stitching is the simplest way of joining two pieces of neoprene, but is the least effective at keeping water out. This stitching method is not used on high-end wetsuits and would only be found on summer wetsuit or cheaper wetsuits. The two edges of the panels are rolled together and then stitched to hold them together. 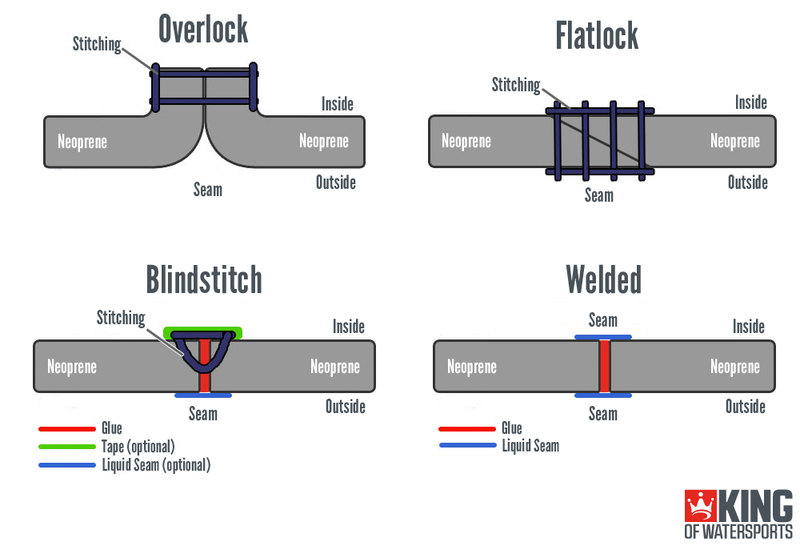 The overlock drastically reduces the flexibility of the seam. It also leaves a bulge on the inside of the wetsuit, which can be uncomfortable and result in chafing. Flat lock stitching is the overlapping of two pieces of neoprene and then stitching the seam together. This zigzag stitching method is traditionally used on summer wetsuits because the holes left by the stitching makes them more breathable and cooler to wear. Glued and blind stitched (GBS) wetsuits are of a higher quality. Neoprene segments are glued together and then stitched halfway through the material to make the seam as watertight as possible. Because the stitching doesn't go all the way through the wetsuit and leave any holes, the amount of water absorbed is kept to a minimum. Any water trapped inside the wetsuit only serves to warm the body further, making GBS an efficient method to use on winter wetsuits. A welded seam uses a (silicon-based) urethan seal to join the neoprene panels on high-end wetsuits. This seal acts as a water tight barrier making a wetsuit 100% watertight. The other method of Glued and Blindstitched (GBS) is not 100% watertight as a needle penetrates the neoprene when stitched. Because a welded seam doesn't make any holes in the neoprene, water can not leak through, which will keep you dry and warm. The silicon based seal also offer much more durability and flexibility compared to a GBS seam. Glued Seams: The neoprene panels are glued together prior to stitching, increasing the strength of the seam and creating a waterproof seal. Spot Taped Seams: Tape is glued to the inside of the seam in critical areas to add additional strength where needed. Fully Taped Seams: Tape is glued to the inside of every seam. Neoprene tape can be used to ensure there is no loss in flexibility. Liquid Seam: The ultimate seam seal. A special liquid rubber is applied to the inside seam which makes it 100% waterproof. At King of Watersports we have all of the best wetsuit brands in the industry. We have everything from entry level to top end wetsuits and with all the best development and features that you could need. It is a very competitive industry which means that these top brands are constantly improving their neoprene, seam and design. You could stick to a brand you know or try out a new one. We are confident that all of these wetsuit brands have great like for like features of the highest quality. Wetsuit hoods are ideal in cold water to avoid that horrible "brain freeze" feeling. By keeping your head warm, you can stay out in the water longer. When choosing a hood make sure it is a good, close fit, as a baggy hood will fill with water and make you colder much quicker. Check out our wetsuit hoods. Numb fingers in the winter are a common occurrence for water sports enthusiasts. Wetsuit gloves are a good way to help keep your hands warm in winter. Like hoods, gloves should be close fitting to avoid too much cold water entering and causing your hands to freeze. Check out our wetsuit gloves. Boots are a winter essential and can also be worn in warmer water to protect the soles of your feet from rocks and other potentially pain causing objects. Like all wetsuit items boots should be as tight fitting as comfortably possible to prevent them filling with water, resulting in heavy and cold feet. Check out our wetsuit boots. Once you have bought your new wetsuit, the guideline below will help you get the best possible wear out it. Be gentle when you put on your wetsuit. Yanking your suit about will put undue stress on the neoprene and could even tear seams. Start at the bottom with your feet and slowly work your way up to the waist. To help get your feet through the leg openings, put a plastic bag on each foot and simply slide them through. Once the wetsuit is up to the waist, adjust it so that the bottom half fits correctly over your legs. Then roll the rest of the suit up the body and put your arms through. This again will avoid you over stressing seams. You're in! Now before you do the zipper up, make sure the suit is fits correctly. This will result in less stress being placed on the seams. You should avoid forcing the zip on your suit as it will be costly to repair. Slowly and smoothly is always the best way. Work in the reverse of putting on your wetsuit and take your time. Try not to pull too much on the suit if it is being stubborn, as this can result in torn neoprene and blown seams. Peel your suit off and leave it inside out, as it this will again cause less stress on seams and is better for drying out after use. Before you dry your wetsuit out fully, rinse it with cold, clean, fresh water (the sooner after use the better). This will stop the neoprene drying out and reducing its elasticity. By rinsing out the salt water, the seams will not corrode and therefore giving the wetsuit a longer lifespan. Leave your suit to air dry inside out, but keep it out of direct sunlight. Too much direct sunlight will dry the neoprene out withering the material. Do not hang the wetsuit by the shoulders as this can cause problems with shoulder seams. void using metal hangers as these can rust and result in staining. The best way to hang it out to dry is to put it through a large plastic coat hanger or over the washing line by the waist. Flip the suit the right way round once the inside is dry. Never dry your wetsuit in a tumble dryer. This will kill your wetsuit. Store your wetsuit in an area away from direct sunlight that is cool and dry. Make sure the suit is fully dry before placing it on a large wide non-metal hanger to support the shoulders properly. Hanging a suit that is still wet this way will result in stretching. Make sure any Velcro fastenings are done up as this will help avoid abrasions on the neoprene. Do not fold your wetsuit up and store it when wet. This will result in a stench from the neoprene and possibly mould growing on your suit. Do not use use harsh chemical cleaners on your wetsuit as this will ruin the neoprene by drying it out and severely reducing its lifespan. Do not use hot water to rinse out your wetsuit as this can dissolve the glue in the seals. Do not wash your wetsuit in a washing machine as this will kill it.